This beautiful house of worship in Tiffin, Ohio, was recently fitted with a gorgeous Dover Black slate roof. The church, boasting magnificent stained glass windows, natural stone siding and copper highlights, is a popular tourist destination. Originally constructed by Irish immigrants in 1831, it is the oldest continuous parish in the Diocese of Toledo. Restoration efforts strived to retain St. Mary’s classic beauty. 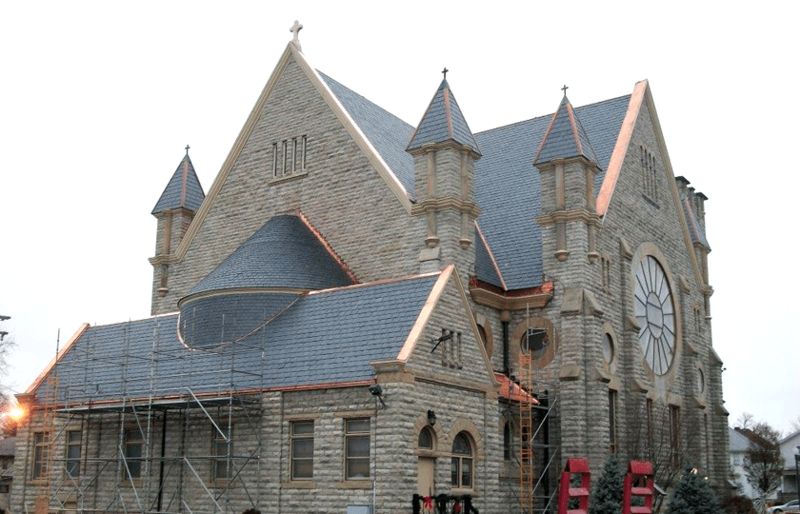 Considering Ohio’s severe weather conditions, natural slate tile was selected as a durable and long-lasting investment that only ads to the church’s character and charm. Visit St. Mary’s Website for more. 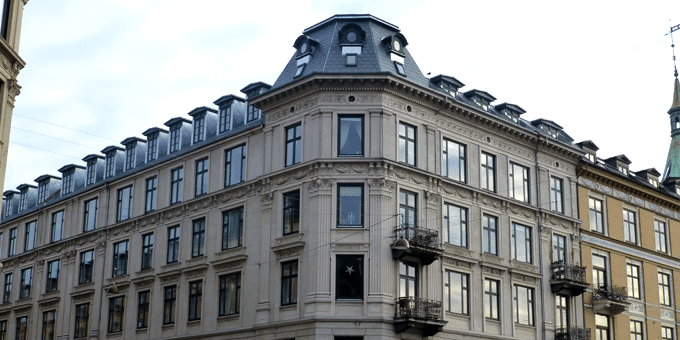 A gorgeous, French-inspired building in Copenhagen recently got a touch-up with natural slate roofing tile. A fixture on one of the main shopping streets, the building’s mansard roof was in desperate need of refurbishment. Mansard roofs, known also as a French or curb roof, feature two slopes on each of its sides, punctured by dormer windows. Using non-fading natural slate tile to replace the older slate ensures that the roof will retain the same dark tone throughout its life. Contrasting nicely with the opal facade, the dark slate affords a classic but bold appearance to the ornate building. Visit Falk Tag & Facade website for more. 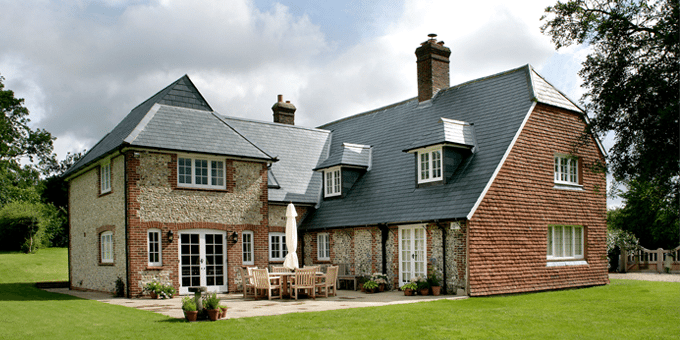 A quaint farm cottage in the rural village of Privett, UK, got a high-end slate treatment when its roof needed repairs. Featuring a facade of sporadic red and white brick, the sturdy slate roof stands as a uniform addition that both complements and stands out. 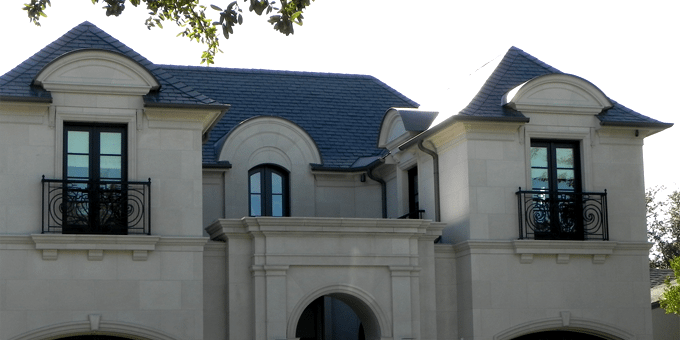 Natural slate tile roofing was specified so that all materials harmonized with the surrounding area. Nigel Land of Skyline Roofing commented that he and his team were “very impressed” with the “superb slate”, noting that he had been in the roofing industry for 30 years. The owners of the cottage, as well, were “delighted with their new roof”. Homeowners spared no expense when constructing this mansion-inspired home in Livingstone, just outside of Dallas. As such, they wanted a reliable, long-lasting roofing material that would also ad a touch of classic beauty. As such, they specialized a black slate roof. Made of unfading, weather-resistant material, natural slate roofs have a lifetime of over 100 years and a chic, timeless appearance. Accented by black balcony ornaments, the slate roof beautifully contrasts the marble-like facade and gives a regal touch to the home. Visit CupaUSA’s website for more. Although renowned as a reliable restoration material, slate tile has often been fitted to lend both strength and style to modern projects. These luxury lodges at KP Golf Club in Yorkshire beautifully complement the surrounding trees, the sleek slate tiles standing out against the wooden facade. Priding itself on its championship golf course, pro shop, bar and restaurant overlooking the Humber River, KP Golf Club spared no expense in constructing comfortable, long-lasting accommodations for their guests. Durable, fireproof, and resistant to freezing conditions, these lodges are prepared for any element. Visit KP Golf Club’s website for more.